It was hard to improve on our perennially best-selling coastal jacket, but our seventh-generation model delivers an improved fabric that is even more waterproof, yet doesn’t sacrifice its outstanding breathability or lightweight comfort. This jacket makes the perfect choice for weekend trips in moderate conditions with its fully lined, fully seam sealed, breathable, 100% water and windproof Oxford nylon outer shell with a Durable Water Repellent (DWR) finish. The articulated hood pod and brushed mesh collar have been improved by adding extra room so when the collar is fully zipped it will allow for the additional bulk of mid layers. Hi-vis, foldaway hood features volume adjuster and one-handed aperture adjusters. Internal layering loops at neck and cuffs. 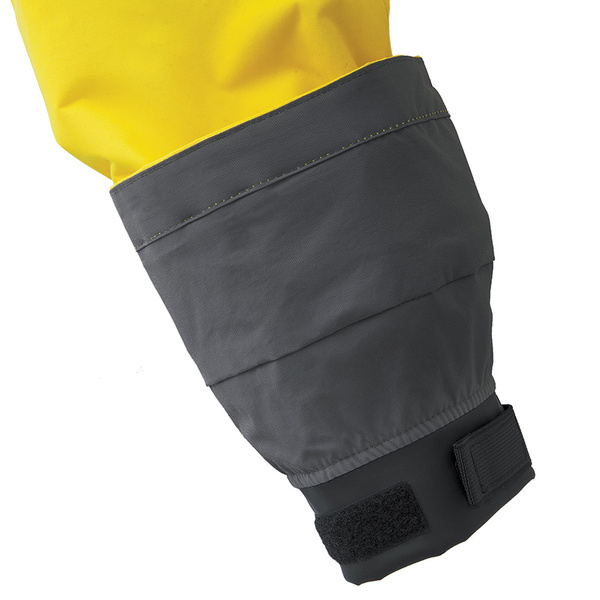 Other additions include cargo pockets that are now angled for easier access, super soft handwarmer pockets are located behind the cargo pockets without zippers for easier use, plus zippered handwarmer pockets have been added at the upper chest to make access easy while wearing a PFD. Internal zip pocket, adjustable cuffs, internal Dartex storm cuff, two-way storm flap with drainage channel, two-way non-corrosive center front zipper and adjustable waist with internal shock cord adjusters. Imported.